Warning: This will be a rather vague post using outrageous assumptions. ARIA Company, the most important location of them all in the whole of ARIA. However fictitious it may be, however impossible it seemed, it was still a requirement for me as an ARIA fan to investigate. 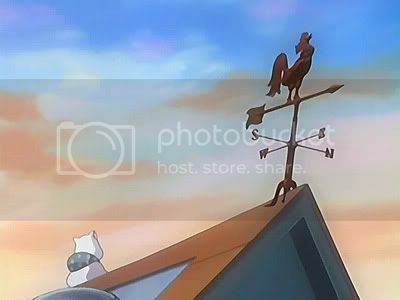 The first thing to find was the compass direction and the producers were ever so kind to include a windvane on the roof...except there is a discontinuity error. ...but faces South in The Origination. However, by piecing together visual and circumstancial evidence, I can quickly conclude that ARIA Company indeed faces South. 1. 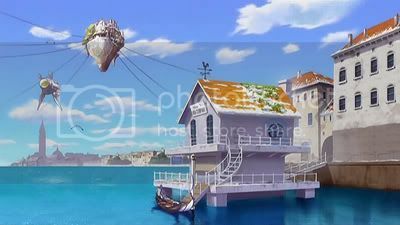 ARIA the Animation ep11, the three of them walk along the waterfront promonade westwards (with Symphony insert song playing). 2. ARIA the OVA ~ ARIETTA, Akari faces East from the Campanile when pointing out the direction of ARIA Company (can be deduced from ground lighting). 3. ARIA the Origination ep5, when the three split up at Himeya after practice, Akari is rowing East. 4. ARIA the Origination ep5.5, Akari approaches the fork of the southern promonade from the West (timestamp 02:20). These evidence point to ARIA Company located somewhere between Himeya and the fork at East Castello on the southern promonade. Looking Westwards from ARIA Company, we see the island of San Giogio Maggiore. 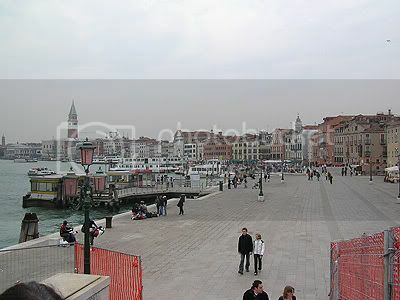 Looking West North West we see the outline of San Marco's Basilica and Campanile. Amano art, view from ARIA Company facing south, with San Giorgio Maggiore seen in the South West, partially obscured by Aika. But a semi-overhead view shows a promonade but with an unfamiliar looking outcrop, with ARIA Company built in front. So while ARIA Company is actually pretty much fiction, one can more or less work out where it's "supposed" to be, the most likely being where the vaporetto stop is on the left hand side of the picture. This in hindsight seems like a useless post - but the amount of overanalysis which went on in my head made me decide I had to get it all out. That's a PDG (Pretty Damned Good) analysis. I had always wondered if ARIA company were actually based on a real location. Brilliant, just Brilliant. That's what I call preparation! Unlike my trip lol. But this confirms my intuition about Aria Company being to the right (east?) of San marco square, as I've mentioned on my Day 1 post. I had this idea because the direction Akari always arrives at San Marco Square after leaving the company. Finally!! I've been waiting for this ever since you started this blog. I thought you had forgot about it. Also, in the Aria Fandisc Navigation, they almost start from there, were you pinpointed the Aria Company. I suppose it was too good to be true that a building exactly like that of Aria Company's would exist in Venice; I doubt it would have ever got planning permission. Well done on finding the next best thing, though. Were there any thoughts on the location of Orange Planet now, even though the building was fake? I seem to have naturally paid attention while watching the first time, and gathered further information at my leisure on my re-watch. If using google maps at my leisure can be called preparation. It doesn't feel right to say leisure = preparation! Gotta save the best for later. ;) I just watched it today and they start end finish on the map at slightly different places (prod error?). My spot is exactly where they finish! I couldn't find any matching landmarks for visual reference - No walled long alley in non-built up area leading towards the walls etc. Although if I had to pick a location based on circumstancial evidence, I'd put Orange Planet on the North coast, next to the Arsenale. I had imagined it would be close to the Giardini, meaning a bit more to the south-east. I had an impression it would have to be on one extremity of the city, but since there's the park down there, I thought it would need to be just in front of the last block of houses there. Then again, I never attempted of doing such an in-depth analysis as you just did. Impressive work, good job! Wow, I just stumbled onto this site, and amazed I am, since I'm a total ARIA fan myself. Awesome analysis! This is great! I have been learning how to use Google SketchUp architectural software, and wanted to make a 3D model of Aria Company. If I manage to get it right, I will see about placing it in the corresponding location in Venice using Google Maps. I'm inspired. I guess I'll have to see about placing them appropriately in Google Earth. Wow, that's excellent work! Your rendering look pretty damn good! Denmark has lots of wind turbines out at sea. Inthernet: Thank you for the kudos, but I must point out that only the windturbine model is my work. Someone else (3D Warehouse username dvorak) must be credited for the excellent rendering of Aria Company. Hello All, the Aria company is located at "Neo-Schiavoni river bank 4914". Established in 2281, uniform design by Ashia Claudia. 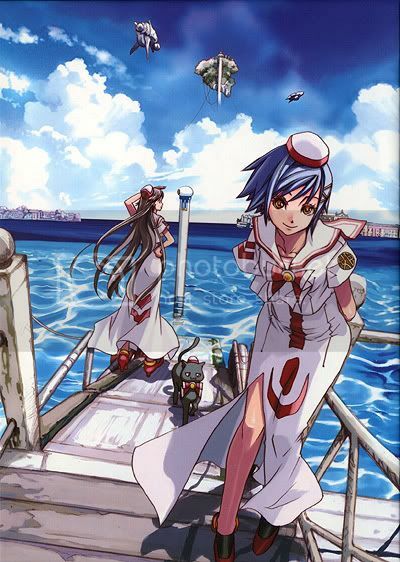 This info is from an official Aria drama CD cover leaflet. BTW, the Babelfish machine translation webservice has a funny habit: it displays the "undine" kana as "bombardier-navigator" in english, no kidding. That's pretty mysterious, but maybe the machine translation engine is confused by the word gondola. (My theory: zeppelin airships also have gondolas, the streamlined things that hold the engines and cabin) and zeppelins have been used to drop bombs in WWI). Anyhow, beware of insulting Alicia in front of Akira or Aika, else you may get bombed! Babelfish is not a reliable source for translating complex words - the stuff it comes up can be hilarious! The Schiavoni river bank is the big southern promonade from P. San Marco. 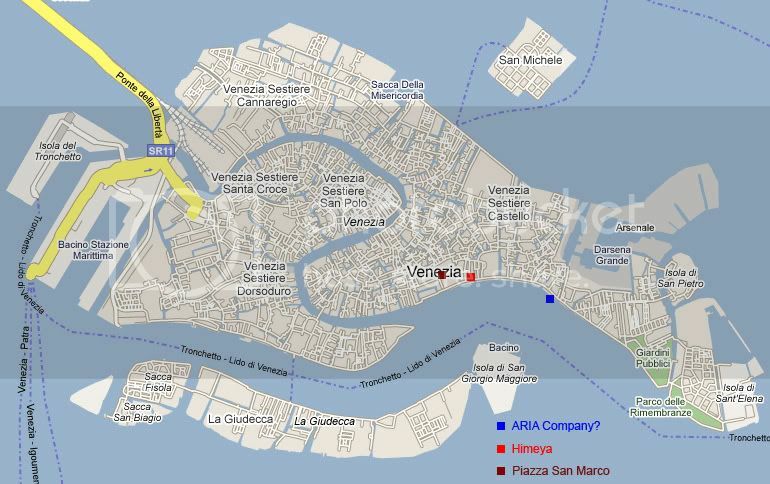 Going by the real Venice, my guesstimation for ARIA Company is 100 metres off, but Neo-Venezia isn't completely identical to Venice! 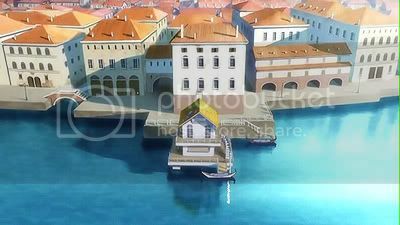 The Google SketchUp blog says that Venice is now modeled in 3D for Google Earth/SketchUp. 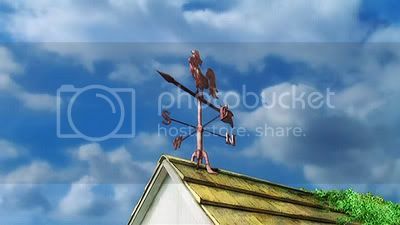 Because I'm a big fan of Aria, I also ask myself were ARIA Company could be an fond this web site. I need ta admit that I was impressed by your deductions. 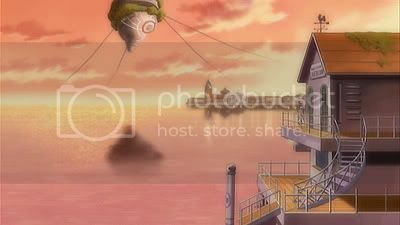 Sadly there also some contradictions in the anime like in ARIA the Natural episode 14 at 13:46 to 13:47 Akari is on the rear balcony with her back facing the water and the Campanile is on her right??? Yes, there are some contradictions and inconsistencies in the anime itself. I based my deductions on the most commonly used scenery.